Oh how I love the imaginations of children! As Walt Disney said "Our most valuable natural resource is the mind of a child". How very true!! In the mind of a child, nothing is impossible. There is no self-doubt or worry that someone will laugh at their ideas. They share them with no reservation. Sadly, at some point in life, that magic is lost. It could be because someone laughs at an idea one too many times, or there just aren't enough opportunities to use one's imagination. Perhaps imaginations are being stolen by technology, read: Self Sizzle Play . Whatever the reason, far too many adults have little imagination, they have lost the ability to think outside the box, to solve problems in new ways. As early childhood professionals, we hold the key for inspiring imaginations. We have the time, we have the resources (books, songs, art supplies, dumpster dive discoveries, re-purposed items...) and we have the minds of children to inspire! Here's an example of how easy inspiring imaginations can be. It can be as simple as reading a story, then responding to the magnifiscent direction the minds of children may take it. 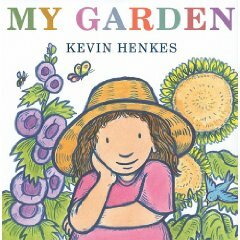 I plopped out the book My Garden by Keven Henkes in the spring of 2010. This is a darling book about a little girl who is helping her mother in her garden. She then drifts off into imagination and talks about what her own garden would be like. Flowers could change color just by her thinking it, if she planted a sea shell, sea shell plants would grow, and (my very favorite) the bunnies would not eat the lettuce because the bunnies would be chocolate, and she would eat them! When I was finished reading (after the "read it agains" had subsided), I asked one simple question. Using as much suspense and wonder as I could muster I simply said "Boys and girls....what if you could have a garden like hers? WHAT would be magical in your garden?". Oh the imaginative ideas the uninhibited mind of a child can have! They imagined starburst bushes and skittle plants, gummy bear visitors and shoe trees. The sparkle in their eyes told me that they believed with all their being that these ideas could be reality. The more they imagined, the more I realized that a candy garden was truly their biggest dream. I decided then that we would make these imaginary gardens come to life. that night, I ran to the store to get starbursts, skittles, gummy bears, gummy worms, chocolate pudding, chocolate teddy grahms, frosting and toothpicks. Let the imaginations go wild! We mixed up the pudding, crushed up the teddy grahms in ziplock bags with rolling pins (oh what fun). After putting in the worms, each child filled their container with the pudding and cracker mixture. Then, the real fun began. Using the toothpicks, candy and frosting they could create anything they could imagine might grow in their gardens! Not only were imaginations flourishing, but little minds were working on other things too. Fingers were coordinating with eyes in order to spread frosting on small starbursts. Patterning skills were used as beautiful skittle flowers emerged. We were cooperating and sharing. We were counting, dividing and sorting. We were enhancing our vocabularies as stories were told of the wonderful creations growing in each child's garden. All of this plus self-esteems bursting at the seams! As you look at these pictures, sure, notice the creations in their hands. But don't overlook the true treasure....the smiles and pride written clearly on the faces of the creators! This year, as the snow melted and we were S-L-O-W-L-Y reminded of spring and the wonder it brings, guess what was requested?! And guess who happily responded! Eight years ago I purchased a new play kitchen set for my daycare. I carefully chose one that had lots of drawers and cupboards to put our utensils, dishes and pots and pans away. When I got it home and had it all assembled, I was suprised to see batteries were required. Without a second thought, I put the batteries in, I was excited to see what this kitchen would do! To my complete amazement this piece of modern technology made boiling sounds when the pot was on the burner, and sizzling sounds when the frying pan was in use. The microwave beeped and the phone rang. "Wow, isn't technology awesome?!" I thought. When I was a little girl I had a plain old wooden kitchen set and I had to supply all the sounds. How wonderful it would have been to play with a toy that made the noises for me. I would have LOVED that! Fast forward well over a year, to the day the batteries died. (hmmm...anyone else now humming "American Pie"?) My thoughts of "what an amazing piece of modern technology" quickly changed to "oh my goodness, what has happened to the imaginations of children?!". After the last "beep" was heard, the children froze. Their play came to a screeching hault. "Nita! The kitchen is broken! It won't let us play anymore!" "Oh no! The microwave won't beep!" I didn't say a word, I just took the frying pan out of the cupboard and cooked up some "bacon" making some Oscar worthy sizzling sounds. I then cracked some "eggs" and scrambled them up, and heated up a cup of "coffee" in the microwave, inserting all of my own stellar sounds of yesteryear (minus the microwave beeps of course...back in the day, microwaves didn't have beeping buttons, and when it did "beep" it was more of a "ting"). No one said a word. They just looked at me. I returned their gaze and simply said "I don't think I could have made such a delicious meal if this kitchen was really broken.". I then excused myself to eat my newly prepared breakfast. That moment made me realize that technology was stealing imaginations. Right from under well intentioned adults who thought they were doing children a favor by getting them toys that made their own sounds. It was then and there that I made an oath to steal it back. Children that spend time at my daycare will use their imaginations. They will be exposed to "self-sizzle play" where all the sound effects are made by them. I am so thankful for the wooden kitchen set and frisbee dishes I had to play with as a child. Because of it, I can inspire children with my own vivid imagination. I can set the stage for them to believe that leprechauns are real, and so are the fairies they make shoes for. We can imagine that planted candy will grow a candy bush. We can solve problems with our imaginations because with imagination, nothing is impossible and all solutions are worth a try. Insert some self-sizzle play into your day and watch those imaginations soar! SIDE NOTE: All posts from this date forward (May 25, 2011) titled "Inspire Imaginations..." will contain stories of real experiences with my daycare children where imaginations were soaring! Enjoy! So, my son and I went dumpster diving at Karl's (the local appliance store) No worries, when you call and ask them to save some boxes they tell you, "oh, just come and dig in our dumpsters" so THAT is what I did. My friend Jen had discovered the most wonderful treasure a few months ago, the fantastic cardboard pieces that hold an appliance nice and snug in the box. These beauties remind me of rain gutters. PERFECT for some ramp play and who knows what else! So my son crawled in and came out with eight of these glorious pieces of cardboard. When we got home, I just plopped them on the daycare floor to await their destiny. Monday morning, the daycare kids came in and there was an instant buzz surrounding these strange new additions to our space. I didn't say a word. I didn't tell them what they were, where they came from or anything, I just stepped back and observed. The first thing I heard was "Wow! Look at these guys!" then I heard "Look Nita! I'm taller then this one" and "Whoa! This one is waaaaay bigger then me!" A good 20 minute exploration of measurement followed. They were sorting the new toys by size, they were figuring out who was the same size as each of them. They were imagining what animals might be the same size, imagining giraffe necks and gorilla arms. Then, the moment I anticipated finally happened, but not at all in the way I had imagined. Jack announced that he was the same size as the one he was holding....but wait a minute Ty made an important observation and said "Oh no you aren't Jack! LOOK! You are holding it like a slide! Let me hold it. I KNOW it is taller then you" The word "SLIDE" is all it took for the ramp rompous to begin! They were working together, problem solving, taking turns and being down right creative in order to get cars, then ping pong balls, then rubber balls of all sizes to make it down the ramp. THEN, they decided to make the ramp turn. Do you see the learning here?! Holy cats there is learning all over the place! More learning then I could have EVER planned ahead for! I knew they would eventually make ramps out of these cardboard delights, but I would have never guessed they would first provide themselves with a nice lesson about measurement, and same and different, and bigger and smaller. I could have never planned such fantastic conversations bursting with learning. Thank goodness I have learned the value of plopping and stepping back. It's hard to do, but so worth it in the end!